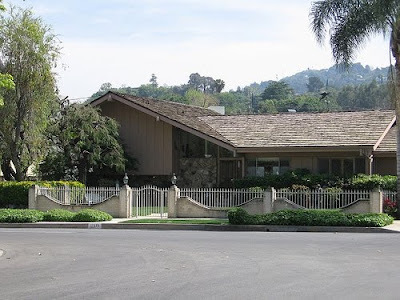 Whenever I see a home designed by Ken Freeman in Bradley Park in Bethesda, Mantua in Fairfax or Normandy Estates in Potomac, I can’t help think of the 1960s “California contemporary” home from the “Brady Bunch.” Unlike others, who use the comparison in a derisive manner, I make the connection in a positive way. The “Brady Bunch” house featured a sloping roof-line, that large open living room, extensive glass above the front door and how can you forget that cool staircase. Take a look at this 1965 Freeman in Lake Normandy Estates to compare. (It was listed five days ago and is already under contract.) Freeman was a New York clothing designer who moved his family to Maryland in the 196os to become a real estate developer. He briefly worked with his brother, Carl, presumably Carl M. Freeman, who introduced the “California Cottage” to East Coast when his company built an award-winning community in 1947 in Carole Highlands, Maryland. Like his brother, Ken sought to mix things up here in Washington. “He was nontraditional. He didn’t like the brick Colonials in Washington. He said they all looked the same. He said they were boring, very closed-in, old ideas. He just liked houses being different . . . clean lines, simple and tailored. It was like a religion to him,” Freeman’s daughter, Judith O’Callaghan, was quoted as saying in this 2005 Post story on Bradley Park. Glad there were a few visionaries here to give us the mid-century modern housing stock we have today. I love that Lake Normandy house! Not surprised it sold fast at that price. I also always loved the Brady Bunch house as a child… now I'm wondering if that's where my appreciation for the "California Contemporary" style came from!!! My father used to live a few doors down from the actual house, though they had it pretty well covered from street view. As much as I loved the show, I pretty much loathe the typical California contemporary split/bi-level style. I'd much prefer a Neutra, Eames or Eichler (close to my budget) to those any day. When I arrived in Washington, I too thought that all the brick Colonials were boring, too abundant and all the same. (Why can't developers ever get this message? I and several other families I know don't want to live in a classical cramped brick box!) I wondered for years where all the more contemporary, modern homes were until I came across Modern Capital. Now at least I have some hope on the horizon when I decide to move into a home around the area. My wife and I got quite excited as we read this blog entry by you. The reason is we are the happy buyers of the house you mentioned as an example of Ken Freeman's design. The other day a contractor told me that he thought the whole contemporary concept was just a builder's excuse to use less and lower quality materials, to be sloppy about the design, etc. That dampened my enthusiasm about our purchase quite a bit. But then I got excited again thinking about how much happier I will be living in that house full of light, with much open space, a bright, open, dry basement,etc. Granted we will need to spend quite a bit to fix the kitchen and the master bedroom, to widen the original bathrooms, and budget permitting to cut up that roof and build a brand new bedroom with glass walls up there, we are still very happy with the enormous garden paved with cobble stones, the woods with many tall mature trees, and that feeling of being surrounded by nature. You are right about DC's colonial houses. Both my wife and I, Vietnamese having been here for 10 years, feel uncomfortable with them, too stuffy, too stingy, too formal, too strict. Anyway, thanks again. We plan to repaint the exterior also so if you have any color ideas that you like please send them to us. We would love to honor you by using the color scheme that you pick out for us. Thanks so much for you comment. Congrats on the house. I would be honored to help you with color ideas. Please e-mail [email protected] if you see this. The Brady Bunch never would have had an fenced-off front yard! Granted it's your house, but cutting up the roof to build a new bedroom would really ruin the great lines of this house IMO. Aren't 5 BRs enough?! Anyway, hope you at least hire a good architect!